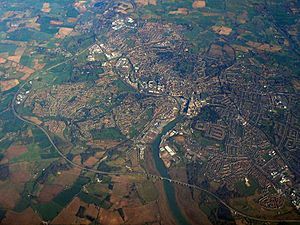 Ipswich ( i/ˈɪpswɪtʃ/) is the county town of Suffolk, England, located on the estuary of the River Orwell, about 60 miles (97 km) north east of London. The town has been continuously occupied since the Saxon period, and its port has been one of England's most important for the whole of its history. Ipswich is one of England's oldest towns, if not the oldest. The claim has also been made of the Essex town of Colchester, but that town was abandoned for some time, leaving Ipswich to claim to be the oldest continuously inhabited town in England. A large Roman fort, part of the coastal defences of Britain, stood at Walton near Felixstowe (13 miles, 21 km), and the largest Roman villa in Suffolk (possibly an administrative complex) stood at Castle Hill (north-west Ipswich). The modern town took shape in Anglo-Saxon times (7th–8th centuries) around Ipswich dock. As the coastal states of north-western Europe emerged from the collapse of the Roman Empire, essential North Sea trade and communication between eastern Britain and the continent (especially to Scandinavia, and through the Rhine) passed through the former Roman ports of London (serving the kingdoms of Mercia, the East Saxons, Kent) and York (Eoforwic) (serving the Kingdom of Northumbria). Gipeswic (also Gippelwich)) arose as the equivalent to these, serving the Kingdom of East Anglia, its early imported wares dating to the time of King Rædwald, supreme ruler of the English (616–624). The famous ship-burial and treasure at Sutton Hoo nearby (9 miles, 14.5 km) is probably his grave. The Ipswich Museum houses replicas of the Roman Mildenhall and Sutton Hoo treasures. A gallery devoted to the town's origins includes Anglo-Saxon weapons, jewellery and other artefacts. Ancient House is decorated with a particularly fine example of pargeting. The 7th-century town was centred near the quay. Towards 700 AD, Frisian potters from the Netherlands area settled in Ipswich and set up the first large-scale potteries in England since Roman times. Their wares were traded far across England, and the industry was unique to Ipswich for 200 years. With growing prosperity, in about 720 AD a large new part of the town was laid out in the Buttermarket area. Ipswich was becoming a place of national and international importance. Parts of the ancient road plan still survive in its modern streets. After the invasion of 869 Ipswich fell under Viking rule. The earth ramparts circling the town centre were probably raised by Vikings in Ipswich around 900 to prevent its recapture by the English. They were unsuccessful. The town operated a mint under royal licence from King Edgar in the 970s, which continued through the Norman Conquest until the time of King John, in about 1215. The abbreviation 'Gipes' appears on the coins. King John granted the town its first charter in 1200, laying the medieval foundations of its modern civil government. In the next four centuries it made the most of its wealth, trading Suffolk cloth with the Continent. 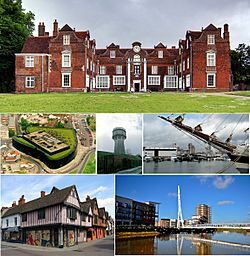 Five large religious houses, including two Augustinian Priories (St Peter and St Paul, and Holy Trinity, both mid-12th century), and those of the Greyfriars (Franciscans, before 1298), Ipswich Whitefriars (Carmelites founded 1278–79) and Ipswich Blackfriars (Dominicans, before 1263), stood in medieval Ipswich. The last Carmelite Prior of Ipswich was the celebrated John Bale, author of the oldest English historical verse-drama (Kynge Johan, c.1538). There were also several hospitals, including the leper hospital of St Mary Magdalene, founded before 1199. 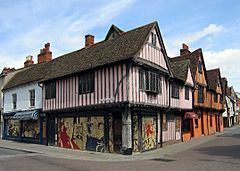 Around 1380, Geoffrey Chaucer satirised the merchants of Ipswich in the Canterbury Tales. Thomas Wolsey, the future cardinal, was born in Ipswich about 1475 as the son of a wealthy landowner. One of Henry VIII's closest political allies, he founded a college in the town in 1528, which was for its brief duration one of the homes of the Ipswich School. He remains one of the town's most famed figures. The painter Thomas Gainsborough lived and worked in Ipswich. In 1835, Charles Dickens stayed in Ipswich and used it as a setting for scenes in his novel The Pickwick Papers. The hotel where he resided first opened in 1518; it was then known as The Tavern and later became known as the Great White Horse Hotel. Dickens made the hotel famous in chapter XXII of The Pickwick Papers, vividly describing the hotel's meandering corridors and stairs. The building now houses branches of Starbucks and Cotswold Outdoor. The Tolly Cobbold brewery, built in the 18th century and rebuilt in 1894–1896, is one of the finest Victorian breweries in the UK. There was a Cobbold brewery in the town from 1746 until 2002 when Ridley's Breweries took Tolly Cobbold over. Felix Thornley Cobbold presented Christchurch Mansion to the town in 1896. Smaller breweries include St Jude's Brewery, situated in an 18th-century coach-house near the town centre. The Willis Building is a glass-clad building owned by Willis. Designed by Norman Foster, the building dates from 1974, when it was known as the Willis-Corroon building. It became the youngest grade I listed building in Britain in 1991, being at the time one of only two listed buildings to be less than 30 years old. Ipswich has undergone an extensive rebuilding and a gentrification programme, principally around the waterfront. 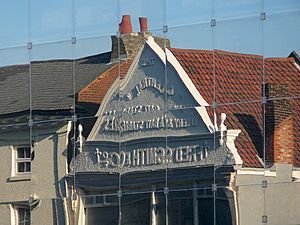 Though this has turned a former industrial dock area into an emerging residential and commercial centre, its completion was at the expense of much of the town's industrial and maritime heritage and in spite of efforts made by a local civic group, The Ipswich Society. Much of this development is residential, marketed to affluent DINKs. As such, some have considered it incompatible with Ipswich's existing socio-economic mix. Ipswich remains a 'town' despite a few attempts at winning 'city' status. It does not have a cathedral, so the Bishop of St Edmundsbury and Ipswich is based at Bury St Edmunds, the former county town of West Suffolk. The Ipswich docks area ("the waterfront") is now devoted primarily to leisure use and includes extensive recent development of residential apartment blocks and a university campus. Businesses operated from the dock include luxury boats and a timber merchant. Other industries have been established to the south of the wet dock. The Ipswich Village Development, begun in 2002 around Russell Road, is home to Suffolk County Council and Ipswich Borough Council. Holywells is the area around Holywells Park, a 67-acre (27 ha) public park situated near the docks, and the subject of a painting by Thomas Gainsborough. Alexandra Park is the nearest park to the waterfont's northern quay, and situated on Back Hamlet, adjacent to University of Suffolk. Chantry is a housing estate and park to the town's south-west. 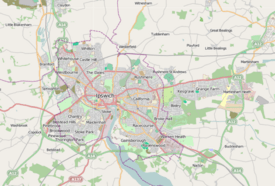 Districts outside the town centre include Bixley Farm, Broke Hall, California, Castle Hill, The Dales, Gainsborough, Greenwich, Kesgrave (which is actually a separate town situated in Suffolk Coastal District), Maidenhall, Pinewood, Priory Heath, Racecourse, Ravenswood (built on a former airfield), Rose Hill, Rushmere, Springvale, St Margarets, Stoke, Warren Heath, Westbourne, Whitehouse and Whitton. To the east of the town is Trinity Park near Bucklesham the home of the annual Suffolk Show, a typical county show. The 'Trinity' is the name given to the three animals native to the county of Suffolk, namely Red Poll cattle, the powerful Suffolk Punch horse and the black faced Suffolk sheep. 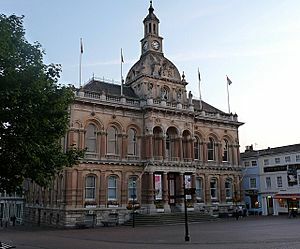 Ipswich is home to many artists and has a number of galleries, the most prominent of which are at Christchurch Mansion, the Town Hall, in Ancient House and the Artists' Gallery in Electric House. The visual arts are further supported with many sculptures at easily accessible sites. The Borough Council promotes the creation of new public works of art and has been known to make this a condition of planning permission. 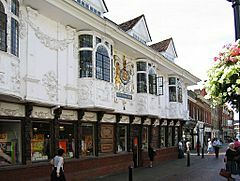 The town has three museums - Ipswich Museum, the Ipswich Transport Museum, and Christchurch Mansion. DanceEast, which has the primary aim of advocating innovation and development of dance in the East of England is now resident in their new premises as part of the waterfront development . They are building new premises as part of the waterfront development. These are the first custom built dance facilities in the East of England at a cost of around £8 million. The Eastern Angles theatre group is based at the Sir John Mills Theatre in Ipswich, named after the famous actor who lived in Felixstowe as a child. In 2012 it celebrates its 30th anniversary. 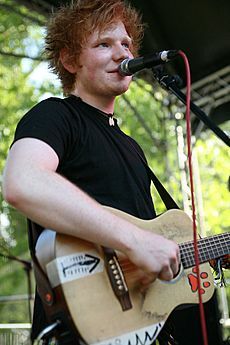 The group engages in rural tours and seasonal performances. The Ipswich Jazz Festival is a jazz music and arts festival started in 2015 in partnership with the Ipswich Arts Festival and mixes established jazz talent, rising stars and regional players. It also features art and photography exhibitions, film screenings and workshops held in venues across the town. 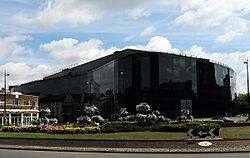 Norwich remains the regional centre for TV broadcasting, but both BBC East and Anglia TV have presenters and offices in Ipswich. The town has five local radio stations, BBC Radio Suffolk covering the entire county, where the East Anglian Accent can be heard on its many phone-ins, the commercial station Heart East Anglia which was founded in 1975 as Radio Orwell covering the A14 corridor in Suffolk, and Town 102 which was founded in 2006 and is the first full-time commercial station specific for Ipswich. The younger audience is catered for with Suffolk-based Kiss 105-108. Ipswich Community Radio was launched in 2007. The town's daily newspaper is the Ipswich Star a sister title to the county's daily newspaper the East Anglian Daily Times. In addition to the Christchurch Mansion and Ancient House, Ipswich in the 21st century has some important cultural buildings including the New Wolsey Theatre and the Regent Theatre – the largest theatre venue in East Anglia where, in the 1960s, the Beatles performed when it was still known as the Gaumont. There are several medieval Ipswich churches but the grandest is St Mary le Tower, rebuilt by the Victorians. Holy Trinity Church by Ipswich Waterfront is one of the few churches in the country which was built during the reign of William IV and whilst the outside looks plain, the interior is quite spectacular. The world's oldest circle of church bells is housed in St Lawrence Church. 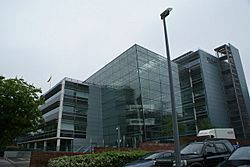 Modern buildings include Endeavour House (headquarters of Suffolk County Council and formerly home of the TXU Corporation, Grafton House (home of Ipswich Borough Council) and Ipswich Crown Court, all located on Russell Road (Ipswich) in the area known as the Ipswich Village Development, which includes Portman Road stadium. The stadium has hosted England under-21, under-23, and international soccer matches, as well as rugby union and hockey matches. Ipswich experiences an oceanic climate, like the rest of the British Isles, with a narrow range of temperature and rainfall spread evenly throughout the year. One of the two nearest for which data is available is East Bergholt, about 7 miles (11 km) south west of the town centre and at a similar elevation, and similar river valley/estuary situation. The average July maximum of 23.2c(73.7f) is the third highest for a major settlement in the country, behind London and Colchester, illustrating the relative warmth of the area during the summer part of the year.The record maximum is 35.2c(95.4f), set during August 2003. Typically 24.9 days of the year will record a maximum temperature of 25.1c (77.2f) or above, and the warmest day of the year should reach 30.0c(86.0f), on average. The absolute minimum is -16.1c(3.0f), set in January 1963, although frosts have been recorded in all months except July, August and September. In an average year, 55.33 nights will report an air frost. The lowest temperature to be recorded in recent years was −14.5 °C (5.9 °F) during December 2010. The weather station at Levington is even closer than East Bergholt at 9.4 kilometres (5.8 mi) from the town centre further down the river estuary on the way to Felixstowe. It has a slightly more marine climate than East Bergholt, with slightly lower highs and milder lows throughout the year in the 1981-2010 average period. It is slightly less prone to frosts, averaging 35.5 such occurrences in a calendar year. Sunshine levels at 1707.7 hours per annum are relatively high for the British Isles, but not abnormal for southern parts of England. Ipswich Facts for Kids. Kiddle Encyclopedia.